Finally, after a long wait of Amazon being launched, Amazon Prime is here now in India. One of the most popular paid subscriptions in The U.S., Prime has been launched with a 60 days trial period in India. Users can subscribe Amazon Prime right away from here. After the expiration of trial period you will have to shell Rs. 499 for a year’s subscription under launch offer. Once the offer ends, you will have to pay Rs. 999 for a year. What You Get In Amazon Prime Subscription? Amazon Prime will provide Guaranteed Unlimited One-Day and Two-Day delivery options to over a hundred cities in India, with no minimum order size. 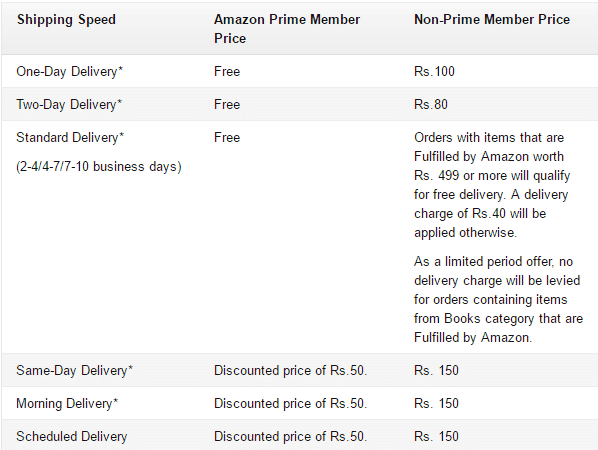 This is one of the biggest advantages of Amazon Prime as currently we have to pay Rs. 49 as shipping charges if the order size is less than Rs. 499. So considering Rs. 49 as 1 time delivery charge for 1 order of less than Rs. 499, you will make the cost of Amazon Prime subscription in 10 orders logically (Rs. 499 as Amazon Prime Subscription fee). Along with Free One-Day and Two-day deliveries, Amazon Prime members will also get discounted Same-Day, Morning & Scheduled Delivered in New Delhi, Bangalore, Mumbai, Hyderabad and few more cities. Along with delivery benefits, Prime members will also get an exclusive 30 Minutes early access to lightening deals, every day. Along with early access to Lightening deals, Prime members will get few special deals on Amazon which would otherwise won’t be available for Non-Prime Subscribers. The Same-Day, Morning and Scheduled delivery can be availed at the discounted price of Rs. 50. Not all the items are under Amazon Prime service, but close to over 75% of listings will be under it. The logo of beside the price of the listing denotes that the produce is under Amazon Prime. Please do note that Prime will be available only on Amazon Fulfilled items. No seller fulfilled items will come under Amazon Prime, as of now. Please note that the current Return Policy of Amazon will remain unaltered for Prime Subscribers. Go to Amazon Prime page. Click or tap on the Start your 60-day free trial button. Want to discontinue Amazon Prime? If you want to discontinue your Prime subscription, you may do it any time by visiting “Your Membership Settings” on Prime Central in your Amazon account. If you have not used any privilege of Prime subscription, your entire money will be refunded. There is more in the Bag. Prime subscribers will soon get an exclusive access to Amazon’s Original TV Series and Movies along with other premium movies and TV shows from both Indian and global content providers.